I am highly organized person, and my friends tend to say it to me how super organized I am. I believe that I am, but not that much. There are people, who track every activity and things in their life, there are people who make their diaries so pretty, there are people who are detailist and perfectionist. I am just to some extend. However, I do more of the organizational thing than average I guess. I am not saying that others are messy and unorganized and whatsoever, but I just like structure, flow and clear path. Let me share you some tips that I personally use which may help you to get better organize your time and schedule. Time management is crucial, whether it is about your work, school, events or personal life. I am sharing Top 10 tips how to get yourself time managed and organized! I like pen and paper. I like colours, stickers and different covers every year. I am old fashioned, but it works for me. I write down literally anything in the diary. Exams, all my meetings, events that I am attending, workshops, travel plans and timings, birthdays, when somebody is coming to see me etc. etc. My note has to include time from-to, what the duty is, location (address) of the place or any important booking references. It is much easier for me to have it all in one when needed in a hurry, instead of looking up in my messages or emails for an address or reference numbers. Writing everything important down helps me to visualize my time schedule over a week or longer, so when planning a photo shoot or a meeting, I can clearly see which days or time I am free. Additionally, every diary has notes or some blank lines and papers at the back of a diary. I use that to write down my thoughts or key words. I often have random thoughts when travelling or when I am at work, and if I do not have a paper around me, I have a diary to write down. Google is great that you can make your meetings, events, mail.. sync to a calendar. However, I am not a type of a person who uses technology for reminders and keeping my calendar digitally. But it works for somebody who tend to forget and it will make your life much easier. Instead of manually writing it down and checking all the time, you can rely on reminders and alerts which you can set to your preferences, such as an alert day before or couple hours before. Stick them everywhere. In your daily stuff that you use or rooms that you are passing through. I tend to stick my notes in front cover of my diary or on the wall on my desk. Think which place you use most often. Maybe a mirror? A fridge? A wardrobe? Sticky notes can get too messy sometimes, if you are writing too much and not completing tasks in time. It is good as a reminder what to do, something to memorize or some quick thoughts. Whiteboard is great to schedule your day or week timeline. Easy to remove, add on and nicely visible - black on white. Believe me, there are so many stuff that you don't need on there. Clearing it up will not only make more space, but you will easily find what you need for work and it will feel much cleaner and organized. What else to comment on it. You can buy so many pretty stationery with To Do lists, Agendas and other sheets dedicated for various tasks. Use sticky notes as mentioned, write it in your laptop and put it as your background, whiteboards etc. There are so many interesting ways to do it and you can always personalize it and find which way suits you the best. Your time management would be much efficient as well if you will be organized. On your desk, in all your papers and staff around you and in the room. Do a proper clean up, throw old papers and notebooks that you don't need. Use binders and folders to keep all important papers together. I tend to use binders to keep my school, work and personal assets separate from each other. Then in each separate binder I have sub divisions as in plastic folders to divide different things. Make a habit to sort everything so you know where are things, instead of making a pile of documents. Also, don't forget to check and clean every half a year or at the end of year. There are many things that you do not need anymore or you can keep things in a digital format too. Se yourself a deadline is important to keep on track with things you need to do. There are so many various apps for anything. Reminders, calendars, to-do lists, apps specifically for time management and organisations. Before the day ends, it is beneficial to review what have you done and what needs to be done for next day or in the future time. Plan and schedule your day for tomorrow so you know what you should be doing or what should be done first. 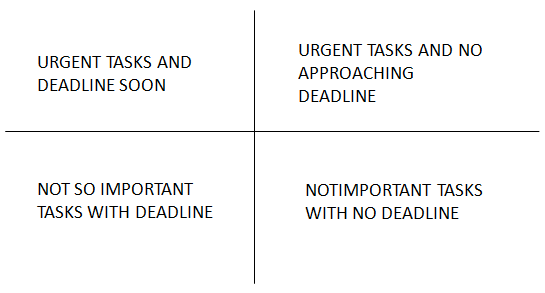 Check what deadlines are coming first, check on what are the most important things to do. Overall, everybody have different schedule, pace, habits, priorities and workload. These tips are just some suggestions on how to change yourself and may be applicable to anybody with any background, goals and environment. However, by doing some certain things, we will learn what works for us and what not. Somebody is keen on papers and colours or on other hand somebody would prefer to have digitalized and automatic. So it doesn’t matter which method you will choose to keep yourself organized and managing your time more effectively and efficiently. The most important thing is to stick with your schedule and have positive results. Any of your tips how you are organizing your stuff and time?